On August 11, LASP research scientist, David Malaspina, will have a front-row seat for the launch of NASA’s newest mission, the Parker Solar Probe. The event, which is scheduled to take place at Cape Canaveral Air Force Station in Florida, will be a must-see for scientists who have spent their careers watching the Sun. Over its seven-year mission, the Parker Solar Probe will fly closer to our home star than any spacecraft in history, dipping to within four million miles of the surface and grazing the Sun’s outer atmosphere, or corona. 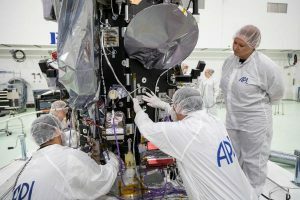 Malaspina is part of a team of researchers and engineers at LASP who are working on the FIELDS experiment, one of four suites of instruments that will ride onboard Parker Solar Probe. Among other questions, the experiment will explore how the Sun’s corona drives solar winds, or charged particles that flow into the solar system, and bursts of other energetic particles. These processes play an important role in space weather, which can damage satellites orbiting Earth. Getting there, however, won’t be easy. Over its lifetime, the Parker Solar Probe will circle the Sun 24 times, using Venus’ gravity to nudge its orbit closer and closer to the corona. In the process, the spacecraft will encounter temperatures of up to 2,500 degrees Fahrenheit (1,371 degrees Celsius) and will hit top speeds of more than 400,000 miles (or about 643,738 kilometers) per hour. “This is one of the riskiest missions that NASA has done in decades,” said LASP’s Robert Ergun, a professor in CU Boulder’s Department of Astrophysical and Planetary Sciences and a co-investigator on the FIELDS experiment. Risky but worth it, the researchers say. That’s because the probe may be able to answer a series of questions that have puzzled scientists for decades: How does the Sun launch solar winds at speeds of 1 million miles per hour or more? And why is the corona, which can reach temperatures of 1 million degrees Fahrenheit, so much hotter than the surface of the Sun, which clocks in at a paltry 10,500 degrees? The answers to those questions, in part, lie in turbulence. Ergun compares the Sun’s corona to the churning liquid at the bottom of a waterfall. Near the Sun, streams of plasma, or gases made up of charged particles, flow in all directions, creating a chaotic and violent environment. The FIELDS experiment will get a close-up look at that turbulence, examining how it spreads energy from the corona into the solar wind. The University of California, Berkeley is leading the FIELDS experiment and the Johns Hopkins University Applied Physics Laboratory (APL) is managing the overall Parker Solar Probe mission along with NASA. The FIELDS experiment will study a wide range of electric and magnetic fields near the sun. The LASP team’s main focus will be on measuring those fields at low frequencies. It’s easier said than done, Malaspina explained. That’s because the FIELDS experiment will collect over 10,000 times more data than the Parker Solar Probe can reasonably store and send back to Earth. To get around that limitation, he and his colleagues have developed an electronics board for the experiment that will automatically scan through data as it comes in—deciding what information to save and what to ignore. With so much riding on the mission, Malaspina said his feelings about the upcoming launch are a mix of eagerness and nerves. But the real white-knuckle moment will come two days after the launch when he travels to Baltimore. There, the mission operations team at APL will begin switching on the Parker Solar Probe’s instruments one by one. “As many times as you test something in the lab, the final test is whether it works in orbit,” Malaspina said.